At last! I can walk out my back door without having to bundle up in my red walking sleeping bag of a coat, a heavy scarf, and a warm hat. I can walk a dog (I now have two) without fear of tripping on dangerous little hillocks of melted then refrozen unshoveled sidewalks. And, best of all, I can work in the garden. But yesterday I walked down the street with a camera. And no dog. The sunshine continues to welcome all kinds of early flowers and awakens foliage. My walk took me to the woods at the end of my street. It’s weird, really, to have that stand of trees in the middle of an urban area, but it’s part of a municipal park behind my house. It’s called a nature center, but it’s really just a pleasant wooded area with a trail that circles around. Lots of people walk their dogs there, as do I.
I have no idea what kind of shrub this is, but the woods host lots of different trees and shrubs. The early evening light turned this one into lovely shades of garnet. The scilla are thriving in yards all throughout the neighborhood. It’s hard to get that true blue in a garden. Or, at least it is hard for me. My soil is is alkaline and acid loving hydrangeas can hardly muster enough gumption to give me a light purple. So, I will appreciate the invasive scilla when it visits. This little scilla blossom landed on the sidewalk. Some lawns on the street are filled with these small blue flowers. There are all sorts of daffodils blooming in the neighborhood. Every spring I tell myself that I will plant oodles of daffs in the fall and every fall I get overwhelmed by the chill that I don’t plant anything but my poster in a warm chair. I did plant the white one below, but only this one has bloomed. I wonder if I will get around to planting more in the fall. While enjoy seeing forsythia in bloom, I’ve never had the urge to plant it in my gardens. I can enjoy it as I walk and then not worry about keeping it tamed. I’d rather use the space for perennials. Four years ago I hung a bee abode in my old cherry tree hoping to attract native solitary bees, especially mason bees. And they have found it their home. Or, more accurately, the females have found it for their maternity ward. Dozens of them have been buzzing in and out of the cylindrical chambers laying one egg and then sealing it up so they can lay another in the next chamber in line. Later in the summer a young mason bee will emerge from the first chamber followed by its siblings behind it. I think the white dribbles are bits of “cement” that the bees use to seal the chambers. It’s why they are called mason bees. You can thank mason bees when you pop a sweet blueberry in your mouth, or bite into an apple. Honey bees, which are not native to North America, aren’t awake yet, and, they have never been the best pollinators. Solitary bees are far better, though, they do not make honey. It is the first plant to bloom this spring, but in a few more days it will be gone, not because its season would have passed, but because it is a weed and was growing where I didn’t want it to, between the pathway bricks. As always, a thank you to May Dreams Gardens for celebrating a monthly accounting of what is blooming in gardens all over the world. It’s April 15 and Michigan played a trick on us. The skies are oxygen blue and cloudless, but the garden is covered in four to six inches of heavy wet snow. It’s ok. Really. There isn’t much blooming yet, a few daffodils and a cute little weed that became my first garden activity of the year. That is, I started pulling it up. The hellebores are eager to open. And they are welcome to do so any time they want. Often called Lenten Roses, this year my hellebores will be blooming during this last week of Lent. What I like about them, aside from their lovely flowers and evergreen foliage is that the flowers hang around for a long time. Their color fades over the season into something that looks a bit like a sculptor wrought them from thin sheets of balsa wood. Perhaps I’ll try drying them in the pages of a book. I gathered oodles of leaves last fall and planted them between the pages of favorite books. I don’t know what I’m going to do with them, but it was comforting over the winter to look at the dried leaves whose colors had deepened and remember that sister leaves would shake free from our bitterly cold winter and start their warming dance again. If it hadn’t snowed yesterday, these hellebores, a gift from a friend, would be open. Tomorrow will see them. There’s always a future in a garden. In January I adopted another standard poodle, Lucy. I hadn’t intended to double my allotment of poodles, but Lucy needed rescuing. I am sitting in my favorite chair as I write this and on the floor around me I see a teddy bear that has lost his eyes, a chew toy that has pockets for peanut butter and biscuits, a beef bone, a kong that just an hour ago was stuffed with kibble and peanut butter, a winter glove, and a paper towel tube. Bridget doesn’t really require toys. She has a favorite bear and a stuffed hedge hog, but she doesn’t chew them. Lucy likes to chew. And chew. I’ve lost two Mac power cords, a whole bunch of pencils and pens, and the buttons off a favorite pair of leather gloves. Bridget is a mellow old girl. Lucy? Not so mellow. She loves to run and jump and because I don’t have a fenced in yard, she runs a jumps through the neighborhood. That will change, I hope, this week when a decorative aluminum fence will go in. But the real issue won’t be one of containment. It will be one of waste disposal. How will the promise of dog feces affect my gardens? I don’t know, but I will find out this week, I hope. And, I will be very glad when Lucy is safely behind a fence and away from the neighbors and a busy street. This daffodil will raise its head and bloom in full today. In the meantime, the garden naps under a coverlet of rapidly melting snow. Soon it will wake up, stretch, and touch warmer days. Usually my head is consumed by class preparations that include reading and responding to students’ conversations about their readings, and planning, planning, planning. September has always been about teaching and barely about gardening. But, I’m retired. And, I’ve decided that I need to see more things blooming in September. So, I went out and bought a bunch of hardy mums and a few asters. Take that, September. Bridget and I needed a photo for our West Michigan Therapy Dog name badge, and since we were sitting in the entrance garden, I thought I’d include us in the “what’s bloomin'” post. Bridget and I continue to bloom, too. Though the blackberry lilies are long since past blooming, their seed pods and seeds are interesting. The rudbekia still has a few blooms. The bees like them and the birds will soon start eating the seeds. This clematis has kicked out a couple more blooms. Here are a few of the mums that I bought. Note the two clematis blooms and the pot of geraniums that, like the other containers, is looking a bit leggy. This container brings a nice bit of color to the hostas in the Secret Garden. This container also brings some color to the Secret Garden. The medal, though, has to go to Walkers Low Catmint. It just keeps blooming. The bees, wasps, and butterflies love it. The wonderful thing about hydrangeas is that once their blooms have “faded” you can pick them and keep them for years, looking exactly the way there were the day they were picked. This is Limelight. Many of its flower clusters will go in a winter bouquet along with Tardiva, and some allium and blackberry lily seed pods. The State Fair zinnias were not as spectacular this year as last, but they provide much needed color and lots of bouquets. I confess that this Knockout Rose has become the star of the rose medallion. It has bloomed all summer and it stands up to japanese beetles and black spot. There is no fragrance, though. What DOES have a fragrance is Sweet Autumn Clematis. It’s a late bloomer. And, sadly, it sometimes doesn’t survive our winters, but it’s a fast grower and I don’t mind planting it again and again. Last are the marigolds that I plant every spring so that when the perennials have gone through their cycle, there is still color in the garden until the first hard frost. It’s easy for me to get distracted and I often postpone tasks that should have been done. Like blogging about the garden on days other than Garden Bloggers’ Bloom Day. I took some pictures a couple weeks ago and have been trying to think of ways to write about the garden other than to document what is blooming each month. But here I am on GBBD and pushing against the clock and prepping for a class tomorrow. Plus I have to walk the dog and ignore the clean sheets that are piled on a chair in the living room and get my annuity stuff together. I’m retiring. Things have to happen. This is what is blooming in my garden today. This is what I see when I come down the street after walking the dog. The old magnolia tree provides a perfect canopy for hostas. So, ok, there isn’t much blooming, yet, but if you look really hard you’ll see some impatiens. Go ahead. Squint. And this is my view from my back door, which is technically my side door. The old cherry tree also provides wonderful shade for hostas. But nothing is blooming. Don’t even try to squint. Let’s get to the good stuff. The day lilies are blooming. You’ll see my affinity for pink day lillies. This gorgeous lilie is called Strutter’s Ball. This is Sea Urchin’s best year. It’s petals always seemed to get scarred during the unfurling process, but not this year. I couldn’t help myself when I saw this First Knight. I don’t usually get drawn to yellow day lilies, but egads, this one is gorgeous. This is perhaps my most dramatic daylily. Meet Red Pinnacle. 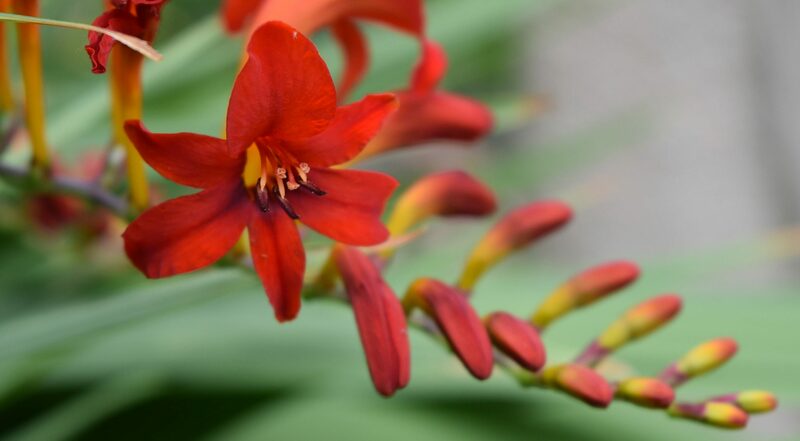 I love the brilliant red of crocosmia. And it provides a nice companion for the day lilies and the Garden Lady. The sunny bed next to the garage has some new tenants–shasta daisies curtesy of my neighbor’s mother, and a division of the crocosmia that is thriving near the Garden Lady. Last summer I hardly set foot in the garden. My trusty gardener did all the work. Richard has been working in my garden for several years and I love what he does. And the garden loves him back. But last summer the garden belonged more to Richard than me. Yeah, I was dealing with surgery and chemo and radiation. And, I taught two classes, but much of that work took place online. It took me weeks and weeks to recover from surgery. And, about six weeks after surgery I started chemo which knocked me flat. So, no gardening for me. This year I get into the garden almost every day and do a little weeding, yank out the ever aggressive dutchman’s pipe, deadhead the day lilies. The garden is mine, though, Richard still does his magic. I don’t know what I would do without dear Richard. He rearranges the hostas, curses at the dutchman’s pipe, and keeps a keen eye out for other forms of garden trouble, like the chipmunk that has made a home under some bricks in the Secret Garden. So, what is this love/hate thing? I love them. I dream 11 months out of the year about my day lilies. I’m quite fond of the pink ones, especially the dark pink lilies. I know. I said that already. But the minute they begin to bloom, they begin to fade. The leaves closest to the ground dry out and turn brown. And the flowers bloom for just one day. Everyday I pluck the previous day’s withered flowers and drop them on the bark that keeps moisture in the soil. I’ve tried to plant lilies that are early bloomers, and others that bloom later, but the hate murmurs softly that each day will bring a little bit of death. I know, day lilies don’t die when they give up their spent blooms, but it’s sad to see the scapes that have no more buds on them. I love hostas, too, and I don’t feel sad at all when their flowers fade. Perhaps I’m being a titch too dramatic. Many thanks go to MayDreamsGardens for the opportunity to share what is blooming in our gardens each month. Here is what is blooming in my gardens today. The limelight hydrangea in the background is HUGE!! It got a hard prune last fall and that, plus our cool wet spring has urged it on. H. Halcyon always stays tidy and keeps its blue. I’m always grateful for annuals. Marigolds brighten up the little nook garden outside the sunroom. There’s always a love/hate relationship between the rose of sharon and me. It’s lovely when it blooms and it’s a pain when it so vigorously self-seeds. Perennial hibiscus in the Secret Garden. Love the wild abandon of echinaceas. The white are Fragrant Angel. That’s white phlox in the middle right. Tardiva is a wonderful draw for native pollinators. The very last daylily of the season–Kathy Perkins. H. June in the Secret Garden. Pink anemone, a gift from a friend years ago. That’s Limelight in the background. It got a hard prune last fall and it’s now taller and fuller than ever. Blackberry Lily in the entrance garden. More of the entrance garden. The Walker’s Low catmint got a big trim and it’s starting to send out new blooms. The rudbeckia gets to shine white the catmint catches its second wind.